Last Friday I finally pulled it off. 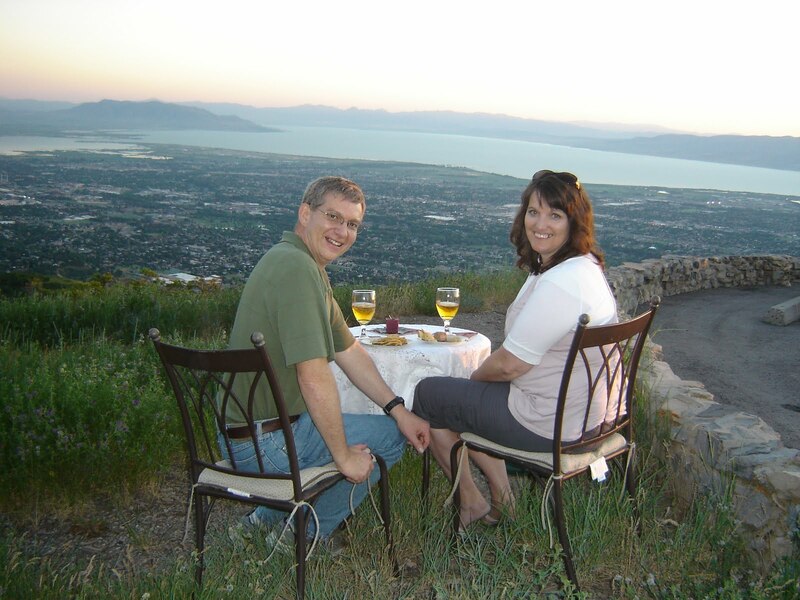 In the fall, we visited Squaw Peak lookout which has an amazing view of Utah Valley. When we were up there, I had an idea for a date. I thought of bringing our bistro table and chairs up there and adding a little romantic spice to an evening. I didn’t tell my wife what we were doing or where we were going on Friday. She had a lot of questions and a big smile on her face. I had to fend her off and disassemble the table so I could hide it and the chairs (and everything else—plates, napkins, tablecloth, goblets, candle) in the trunk. We stopped at a local health food store and while she stayed in the car, I got a bottle of pear juice, some multi-grain crackers, and two raw desserts. As we drove up Squaw Peak road, of course my wife figure out where we were going. But she was still surprised by what I pulled out of the trunk. When I set everything up, I realized I had forgotten the forks. I left them on the kitchen table. Rats. Well, my wife wasn’t disappointed that I had forgotten the utensils. We managed. We had a great time. We stayed for about an hour, until the sun was well below the horizon. We talked and laughed and enjoyed each other’s company. Our 32nd anniversary will be next month. We are still deeply in love. We have had a difficult life, especially recently, but we have each other. Our finances and health are not fully intact, but our relationship is and I’d rather have that intact than the other two, so I am grateful for the nature of our trials. They are more bearable when you have a loving, faithful and understanding companion. We our figuring our how to get back on our feet financially and health-wise. We are doing it together and that’s the best way.